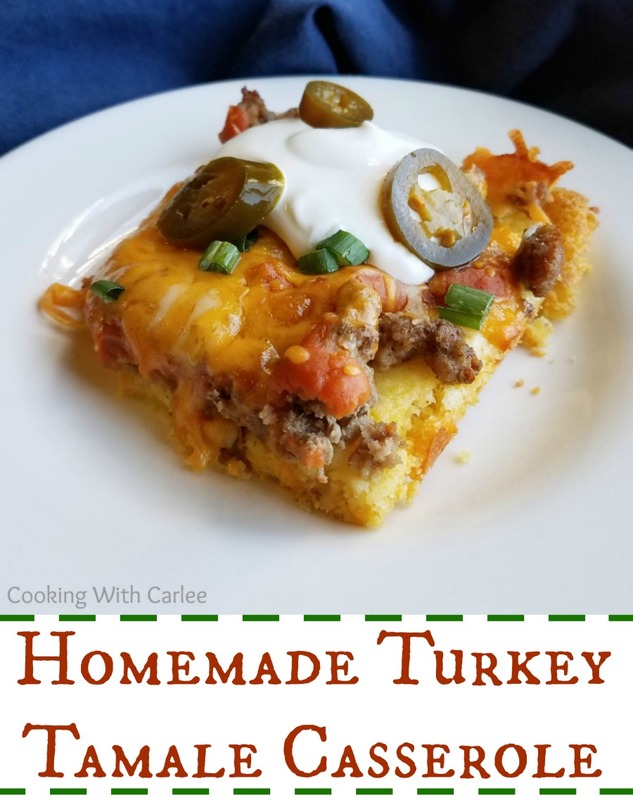 This fun turkey tamale casserole has a soft made from scratch corn base and is so full of flavor. Plus it is so fun to dress up with your favorite toppings! 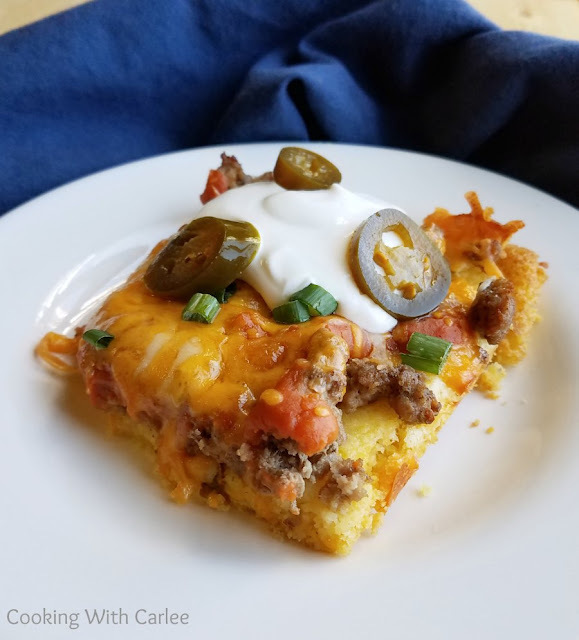 It's one of life's greatest conundrums, what do you do when you are craving turkey tamale pie but you don't have all of the ingredients in the house? Compound that with the fact that you are wearing clothes that you wouldn't be caught dead in at the store, but they are soooooooooo comfy and you just can't imagine changing. And getting in the car. And going to the store. And getting all the ingredients. And coming home. Ugh! It's all too much. So what do you do? I'll tell you what I do! I search the pantry, the freezers and the cabinets. Then I think think think and come up with something that will cure the craving. That is how this casserole came to be. We were in the mood for something fun and filling. Something with a little zing and a layer of cheese. Once that thought gets in your head, it's hard to shake. The fact that I didn't have any cans of creamed corn or boxes of corn muffin mix was not going to hold me back! Luckily I always have frozen corn and corn meal in the house, so I knew we could bridge the gap and get that taste tamale flavor on the table. Of course Little Dude got in on the act. He loves to measure, pour and mix. 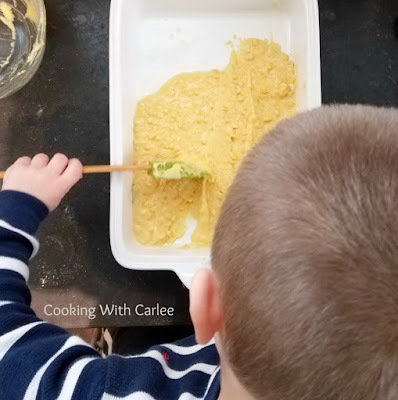 He also had a great time spreading out the corn mixture in the pan. I browned up the meat and made some enchilada sauce while he did his thing. Having a sous chef around is really starting to pay off! While the base baked, we played a game of memory. I tell you what, that kid is good! I like to think his dad and I are pretty on the ball, but he definitely gives us a run for our money. No more missing matches to be nice, now it's an all out battle to not get our butts tromped! When the timer went off all I had to do was sprinkle the meat over the corn base and drizzle on the enchilada sauce. Of course a healthy dose of cheese is the proper way to finish such a thing off. The second round in the oven gave us a chance to lick our wounds from the memory match slaughter. By the time we had the cards cleaned up and the table set, dinner was ready. I like to sprinkle either a little cilantro or green onion on top of the casserole. It's also great with sour cream and jalapenos. All you need is a salad and dinner is done! I love all of the flavors and textures. I also love that it is something all three of us enjoy. Have you ever found yourself craving something you didn't have all of the ingredients to make? Did you go for it anyway? I tend to think these moments of making due with what is on hand is where I shine in the kitchen and my husband would agree. I'd love to hear about some of your greatest improvisations in the kitchen. In a mixing bowl, stir together flour, cornmeal, sugar, baking powder and salt. Add the vegetable oil, egg, milk, green chiles and corn. Stir until just combined. Spread in prepared pan and bake for 15 minutes. Meanwhile, brown the turkey and season with garlic powder, cumin, salt and pepper. After the 15 minutes is up, sprinkle seasoned browned turkey over cornmeal base. 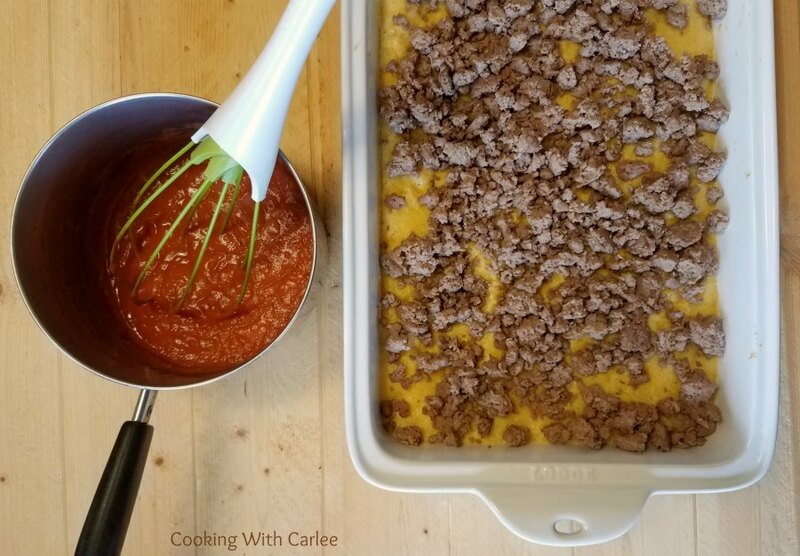 Drizzle with enchilada sauce and cover with shredded cheese. Bake for an additional 15 minutes. Sounds like a fun way to get a meal on the table! I love that little Memory Champ aka sous chef and his parents! He's a force to be reckoned with! Turkey TERRIFIC is what this is!! looks so yummy! And little dude is going to be quite the chef and have one happy wife!!! You're not only the best chef and baker, you're the BEST mama! This recipe is just tugging at my heart strings! Right up my alley! And yes, I'm always subbing and ad-libbing with recipes. Sometimes our fave family recipes come about that way! Well you are the reason why I always have cornmeal on hand now ;-) Thank you! I'm obsessed with tamale and this is such an easy way to enjoy them! It's so much easier to make them in casserole form! Yum! This looks really delicious. It reminds me of something my mom used to make. 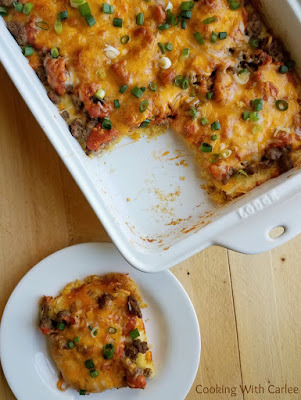 This is a great Tamale Casserole, looks delicious! Hope you are having a great weekend and thanks so much for sharing your great post with us at Full Plate Thursday! Wow looks greatI My husband loves tamales I will have to show him this recipe! Sharing! Thank you for sharing on Merry Monday! Hope to see ya next week! I hope he enjoys this as well, it's so much less work than making tamales! Perfect weeknight meal! Pinned! Thanks for sharing at Friday Frenzy! Hi Carlee, sometimes a girl has to do what a girl has to do, it's also a good excuse to get creative. I've not had tamale before, but it does look like something we would enjoy. This sounds so tasty!!! I feel like I used to be good at improvising, but not so much anymore. Not sure if it's age, or just my smaller kitchen that I don't have as much room to stock things? Or, maybe sometimes it just my reason to get a trip to town for that missing ingredient! I love how you manage to use what you have to make something - you are a girl after my own heart, and the Turkey Tamale Casserole sounds sooo good. Isn't it funny how those kids are so smart!?! They grow up so fast. Your little dude sounds like so much fun.